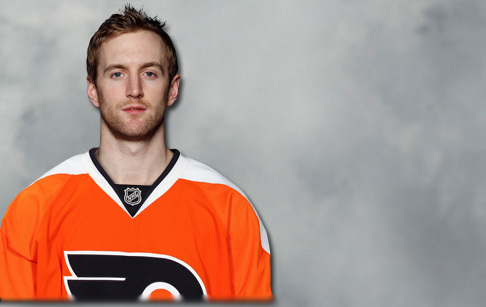 The Philadelphia Flyers have acquired 6-1, 190-lb defenseman Andrew MacDonald from the New York Islanders in exchange for F Matt Mangene, a third-round pick in the 2014 NHL Entry Draft, and a second-round pick in the 2015 NHL Entry Draft, according to general manager Paul Holmgren. He will wear uniform No. 47 for the Flyers. MacDonald, 27 (9/7/1986), has appeared in 63 games for the Islanders this season, during which time he has posted four goals and 20 assists for 24 points. He led the Islanders and is currently ranked eighth in the NHL in average ice time at 25:25 per game, and he leads the NHL with 198 blocked shots. A native of Judique, Nova Scotia, MacDonald was drafted by the Islanders in the sixth round (160th overall) of the 2006 NHL Entry Draft and has played his entire professional career with the Islanders organization. In 295 career NHL games, he has recorded 17 goals and 72 assists for 89 points while averaging 20 minutes or more per game in each of the last five seasons, including 2013-14. 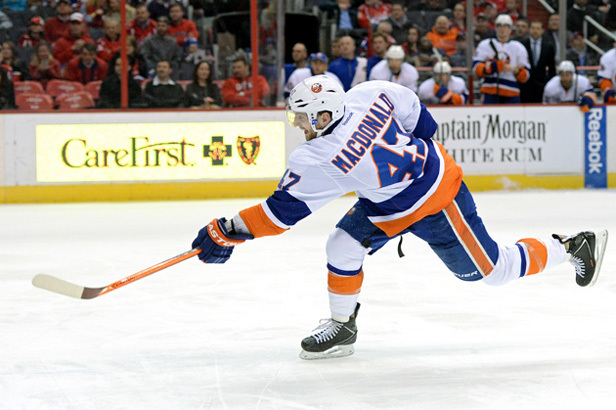 MacDonald has also appeared in 114 games for the Islanders’ American Hockey League affiliate, the Bridgeport Sound Tigers, over parts of four seasons (2006-10). He recorded 13 goals and 33 assists for 46 points and represented Bridgeport at the 2009 AHL All-Star Classic. Mangene, 24 (3/12/1989), signed an entry-level contract with the Flyers on April 2, 2012 and joined the Flyers’ AHL affiliate, the Adirondack Phantoms, following the conclusion of his final season at the University of Maine in 2012. In 92 career games with the Phantoms, Mangene recorded 14 goals and 15 assists for 29 points. The Flyers return to action tomorrow night when they host the Washington Capitals at the Wells Fargo Center (8PM, NBCSN, 97.5 FM). It’s “CLUTCH TIME” for the Flyers and every game matters during the stretch run to the playoffs. For tickets and 2014-15 season packages, call 215-218-PUCK or visit PhiladelphiaFlyers.com.